Amazing techniques which will transform your use of PowerPoint presentations. Make your presentation stand out from the crowd! 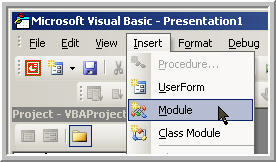 First should you use vba? If the user has only the free viewer the code just won't work! If the user has macro security set higher than medium the code won't load. If your code crashes the user may end up in the visual basic editor which is a BAD idea! Where can I Find Code? Lots of places but the Powerpoint forum, and the programming section of pptfaq are good places and of course on these pages. Paste in the code it should now look a little like Diagram 2 (with different code of course). 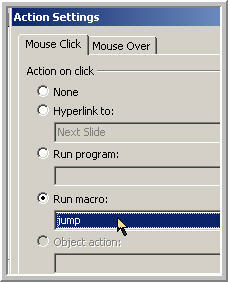 To run code in edit view Tools > Macro >Macros > Run or much easier view > toolbars > visual basic and use the tools there (see diagram 3) The red arrow = run macro and the green go to vb editor. 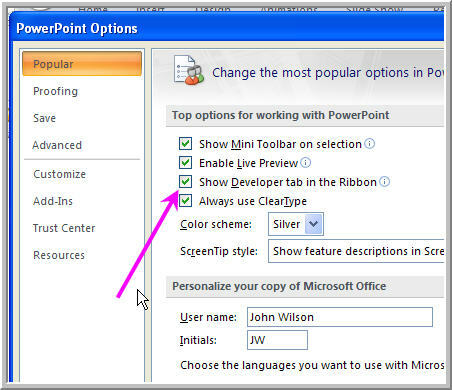 You can open the code editor from the ribbon by choosing Visual Basic in the Developer Tab. 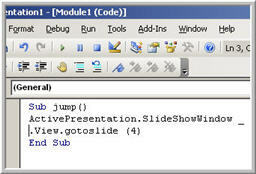 INSERT a new Module and paste in the copied code. Always save as a pptm file NOT pptx. Remember to set your macro security at Medium (Disable with prompt) or saved code won't run! !